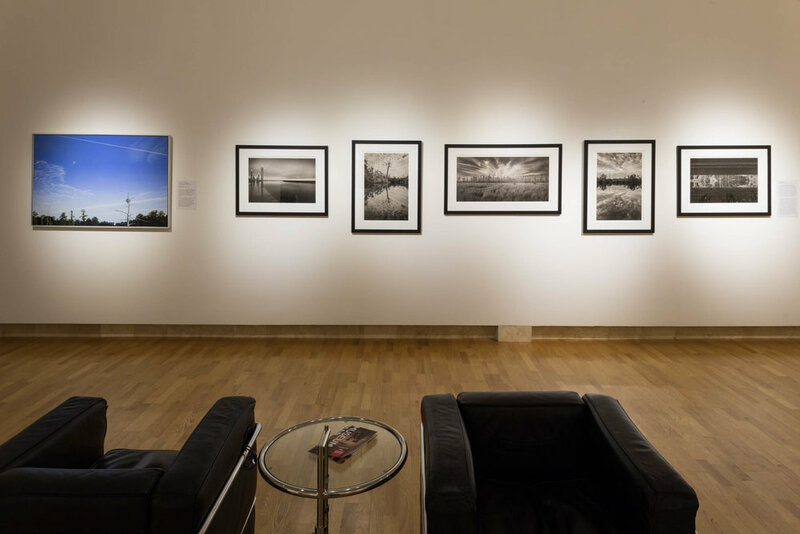 In the summer of 2014, The Cummer Museum of Art and Gardens invited 10 artists to re-interpret river themed works from their collection for an exhibit entitled Reflections: Artful Perspectives on the St. Johns River. The exhibit opened on February 21. I chose to create a series of 5 photographs, derivative work from Streaming South and some other earlier images, that address the confluence of man and nature. The title of my exhibit is Intersections. The painting that was assigned to me was “Osprey Nest, Silversmith Creek” by Joseph Jeffers Dodge. Dodge was trained as an art historian and museum administrator at Harvard University before accepting his first job as curator of the Hyde Collection in Glen Falls, New York. At the same time, he began actively painting and exhibiting his work. In 1962, Dodge was invited to take the director’s position at The Cummer Museum of Art & Gardens, a job he held for ten years before making a full-time commitment to painting. Joseph Jeffers Dodge completed Osprey Nest, Silversmith Creek in 1995 towards the end of his career. It is a view from his home and studio window and supports his fascination with the Florida landscape and the scenery surrounding his residence. I found the painting particularly soothing and minimal while imparting a strong sense of symbolism about our lives and its relation to nature. Upon reading more about Dodge’s work and this painting in particular, I became intrigued with this composition and the main elements within: osprey nest, large tree, three smaller trees, contrails, and the hot air balloon. I was also curious about the cropping at the horizon and removal of the visual context from a foreground defining the creek. Dodge was also an avid photographer and I suspect he may be using a photographic technique to place emphasis on the main visual elements. I have been exploring local creeks and waterways for some time and recently began photographing from a kayak. My approach to this project was not to try to duplicate Dodge’s painting, but to establish my own set of symbolic visual elements from existing images based on a theme that is constantly running through my work – the intersection of man’s presence and nature. We can seek places of solitude and unspoiled wildness, but rarely can we place ourselves in an environment devoid of the influence of man. This is how it is, and we can find ourselves revolted, indifferent, or stimulated by what is there. Surprisingly, I found many of Dodge’s symbols in my images: dominant trees, birds and nests, contrails, and man-made objects. I did choose to include a strong reference to the reflection of the water or flowing grasses, and I placed these “reflections” on a common horizon that runs through each displayed image. My dialog continues as our natural world becomes increasingly altered, constructed, and controlled. Nature always offers a sublime beauty; ever-present and visible to those who are willing to see. The intersection is everywhere, my job is to record and document what I observe. The cooling towers of the St. Johns River Power park loom over the salt marshes of Sisters Creek and the surrounding landscape. A prominent visual fixture constructed in 1987, the massive hyperbolic concrete structures are symbolic of the failures of nuclear power and our insatiable need for energy. Power plants are placed in remote areas because they are inherently dangerous to people and living things. Our presence is indelibly marked. The Ortega River parallels the St. Johns for many miles. South of Ringhaver Park, very little development is visible from the river. This residence is a notable exception. Its presence is portentous. A large dock, screened pool, and manicured lawn represent what money can buy. I was alarmed by the angry barking of two large dogs as I paddled past the compound. The preservation of un-developed shoreline is important. Once a dock and bulkhead establish a presence, the pristine nature of a creek is changed forever. The leafless cypress and large stalking birds are appropriate markers for an intrusion into our natural world. The Okefenokee National Wildlife Refuge is in the middle of nowhere. The area was raped, pillaged, and left to die between 1909 and 1928 when millions of board feet of old-growth cypress were clear cut from the swamp. If not for the Great Depression and the shear difficulty of removing the trees, the devastation would be complete. While photographing this stand of young cypress, I thought about the hundreds of years that must pass before these trees reach the maturity of what was lost. Overhead, the contrail etched a reminder that our “machine” is ever-present and that no place is exempt from man’s influence. 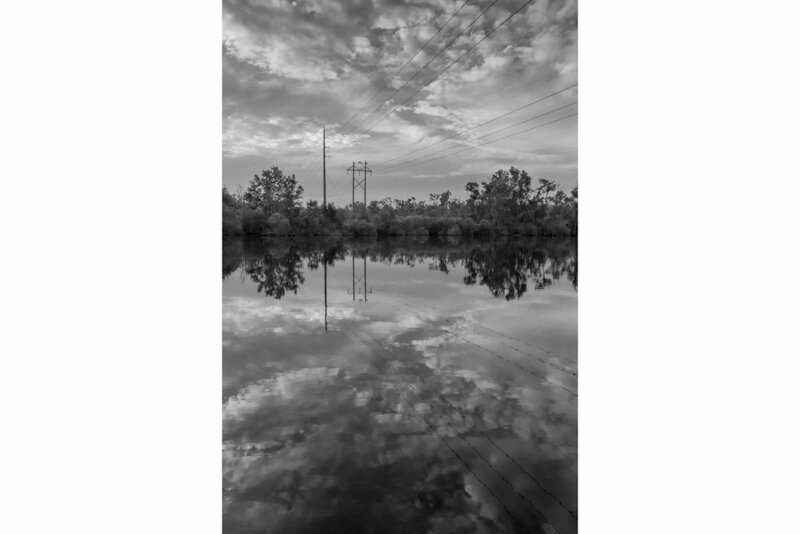 Power lines crisscross our landscape carrying the lifeblood of energy to every cell in our built environment. As I drifted silently under these lines I could hear the hum of the electricity. The flow of water and the flow of power were immediately brought into focus. Both were carrying essential elements, one driven by natural forces, the other driven by an engineered one. I felt comfort that morning knowing I was on nature’s path. I-295 crosses McGirts Creek just east of the Blanding Blvd exit, one of the busiest intersections on the beltway. As the cars and trucks rumbled overhead on 9 lanes of highway, I thought about this marvelous creek holding on to its wildness. Most people probably think they are driving over a drainage ditch if they have any awareness at all. We cannot care about that which we do not know. Places this special and fragile are largely hidden from our consciousness, so only a few defend the need for preservation. Once gone, it is erased for a lifetime. At the The Cummer Museum of Art & Gardens, 2015.